Stately, stylish and multi-functional… A dining table with a difference! The Counter Height Table sitting at an impressive 36 inches high, is the perfect table to host friends for a decadent dinner while taking in your gorgeous view! At counter height and dining table size, this hightop table seats 4-6 people and complements any of our A-Grade Teak counter stools or chairs! For a modern edge add 6 of the ergonomic and intricately designed contemporary counter stools, or go more classic with our traditionally styled counter stools with arms. W31" x L59" x H36"
The design is simple, highlighting the beauty of the wood and easy enough to fit in many spaces for multiple situations! The rectangular table top is modest at 59 by 31 inches, with tightly placed slats, making it a superb choice for outdoor dining and entertaining. 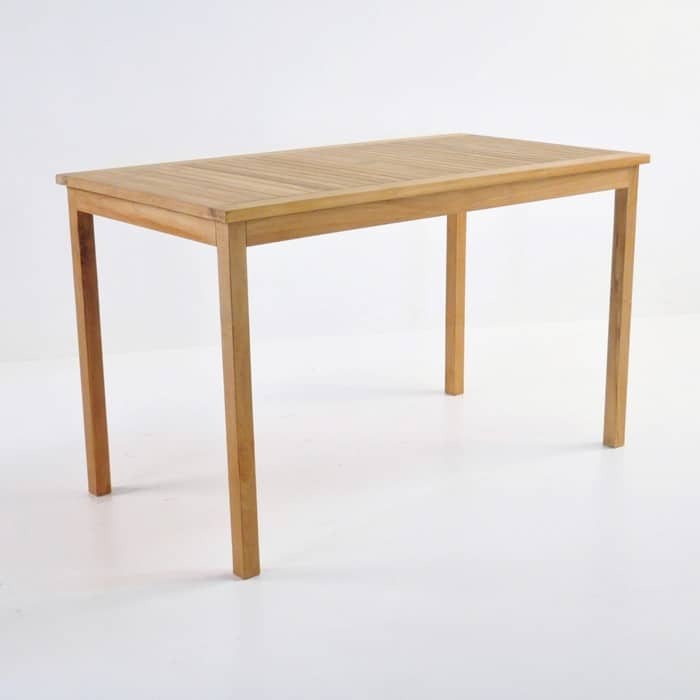 At Teak Warehouse, we pride ourselves on making the best quality all weather products, and the Teak Counter Height Table is no different! 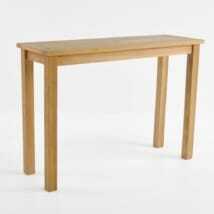 Made out of refined, all purpose A-Grade Teak, highly regarded for its quality and durability. Because the tree has aged at least forty years; A-Grade Teak holds high levels of natural rubbers and oils, ensuring a product that stands up to harsh weather conditions. As well as industrious, stunning A-Grade Teak, we are also proud to house a fine array of other products suitable for outdoor use. Choose from #316 Stainless Steel, Batyline® and Textilene® mesh, All Weather Wickers, Sunbrella® fabrics, Resin, Raw Concrete and Reclaimed Teak for textures that will make your outdoors a retreat for whatever you choose – whether it be dining or reclining, Teak Warehouse has you covered. 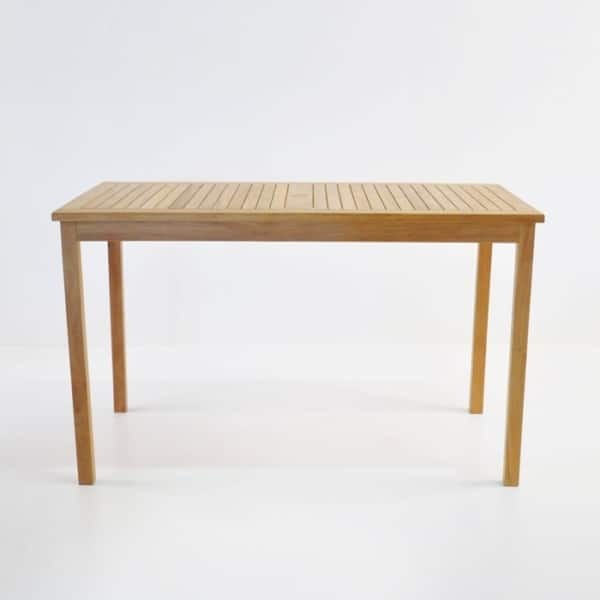 We have many sizes and styles of dining tables and chairs; rich, luxurious deep seating; contemporary pots and planters, sumptuous sun loungers, shading options and much, much more! 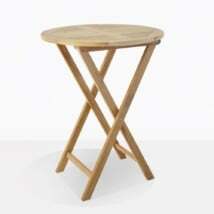 The Counter Height Table is just one of our masterfully built and long lasting products for the great outdoors! 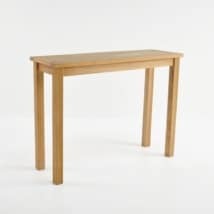 The Counter Height Table also works brilliantly indoors! Place in the kitchen for an ideal breakfast or casual meal set up for you and your family. If you are having a large party at home, use the Counter Height Table as a serving area for all your delicious hor d’oeuvres! We love the Counter Height Table with 4 to 6 of our counter chairs, imagine it placed on a veranda, overlooking a glorious view – in no time you’ll be enjoying dinner and drinks set at this wonderful, stable, inviting table. Feel free to email or call us with any queries about this and any of our fantastic products! Teak Warehouse is open everyday from 10am, and we are waiting to hear from you! Our skilled sales associates can help you plan the perfect outdoor living area that fits in with your architecture and personal taste. 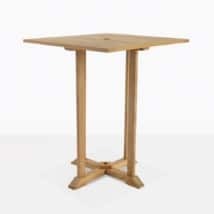 The Counter Height Table is a must for your veranda or garden! This is the perfect in-between of dining and relaxing and enjoying your surroundings. The ideal height giving you the best of both worlds. Call us today to see whether the Counter Height Table might work for you!